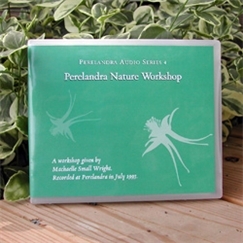 Audio: Perelandra Nature Workshop - Perelandra Ltd. Discussions cover our responsibility for achieving ecological balance in our environment as well as every other aspect in our daily life by working with the nature intelligence, also discusses problems we have in working with nature such as fear, timing and control, communicating directly with nature, and procedures for setting up nature sessions. Includes a discussion on kinesiology. This is a good introduction to working with nature intelligences. "I am having a wonderful time with your approach to life. Simultaneously, I find myself taking to this work like a duck to water—but being overwhelmed by the amount of reading material. So the [audio recordings] really help. I listen to them on my way to and from work, and then approaching the Workbook is a lot easier. Thanks!"